Alexander Schneider was born in Frankenberg/Saxony. He was member of the Dresdner Kreuzchor from 1987 to 1996 before going on to study at the College of Music „Hanns Eisler“ Berlin as a student of Peter Herrmann. In 2004 he gained his degree in singing and education. He attended master classes of David Cordier, Jeffrey Gall and Peter Kooij. He is one of the laureates of the competition „Musica Antiqua“ in Bruges 2002. The Countertenor works with many wellknown ensembles for Early Music like Cantus Coeln, Concerto Palatino, Collegium Vocale Gent, Akademie fuer Alte Musik Berlin, Absolut Ensemble New York, Rheinische Kantorei, Ricercar Consort,Vox luminis, Sette Voci, Dresdner Kammerchor, Ensemble Amarcord, Musica Fiata Koeln and the Lauttencompagney Berlin. Conductors such as Philipp Herreweghe, René Jacobs, Kristian Jaervi, Stephen Stubbs, Herrmann Max, Howard Arman, Joshua Rifkin, Philippe Pierlot, Wolfgang Katschner, Martin Haselboeck, Marcus Creed, Attilio Cremonesi, Hans Chr. Rademann and Konrad Junghaenel have worked with him. Numerous CD- recordings document this work. As operasinger he was guest at the Theater Heidelberg, the Opera Leipzig, the Goethe-Theater Bad Lauchstaedt, the Schlosstheater Potsdam (Neues Palais) and the Theatre Gera. In 2011 he was starring as Oberon in Britten's "A Midsummer Night's Dream" at the Theatre Lucerne. In the international premiere of the Jazzopera „Casanova“ by Daniel Schnyder he sung the "Mozart" in Gstaad/Switzerland and New York City/USA. He founded the Ensemble Polyharmonique, wherein he unites singers from all over Europe to carry out projects with music of the late Renaissance until the baroque era. More and more he also appears as a conductor. 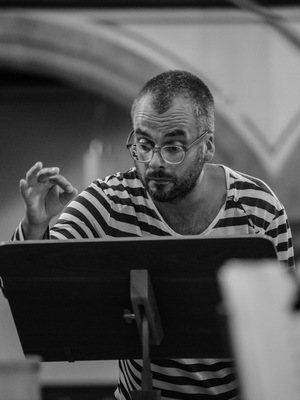 He is the director of the choir Amicantus (province Limburg/Belgien) and conducts classes for choir singers at the Summer-Academy Alden Biesen.